Home Viet Nam Discovery	Where is the largest Korea Town in HCM City? Since the official establishment of diplomatic relations between Vietnam and South Korea in 1992, economic cooperation between the two countries has improved in many fields. Especially after Vietnam had acceded to World Trade Organization, there has been an influx of Korean investors entering the Vietnamese market. 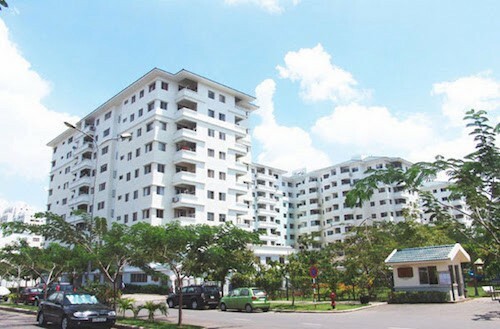 The first Korea Town in HCMC began forming in Tan Binh District, which includes vibrant streets of K300 (Ward No. 12), Tan Son Hoa (Ward No. 2) and Super Bowl (Ward No.4). However more and more Korean have moved to Phu My Hung in District 7 in recent years, making it the largest Korea Town in the city with an estimated population of up to 20,000. Tan Phong Ward, District 7 is the new Korea Town with Korean people account for one third of the population. Many of them choose to stay in the area of Hưng Vượng Building and Sky Garden. Sky Garden has a prime location situated on Nguyen Van Linh Boulevard and is divided into three main stages which includes: The Sky Garden Apartments I, The Sky Garden Apartments II and Sky Garden Apartments 3. Sky Garden apartments is built on 10.4 hectares of land and divided into 42 blocks with over 3000 apartments. The project is considered as a new urban zone with modern infrastructure, green & clean environment, safe and quiet. 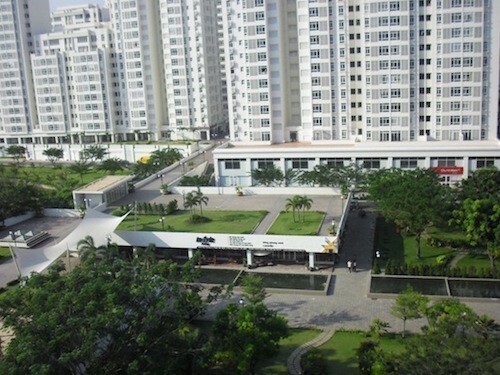 Hưng Vượng Building 1, 2, 3 is located nearby Sky Garden and only 10 minutes by car to District 1. Every apartment comes with 2 bedrooms and floor area ranging from 60 — 100 sqm. With a budget from 400–500USD per month, one can easily find a nice apartment for rent with spacious floor area of 70 sqm and above. 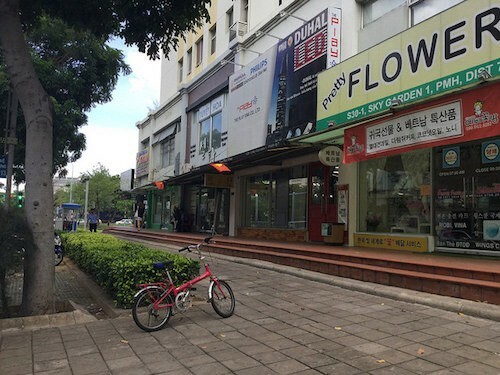 Pham Van Nghi Street lies between Sky Garden 1 and Hung Vuong Building 3 is regarded as the heart of District 7 Korea Town. 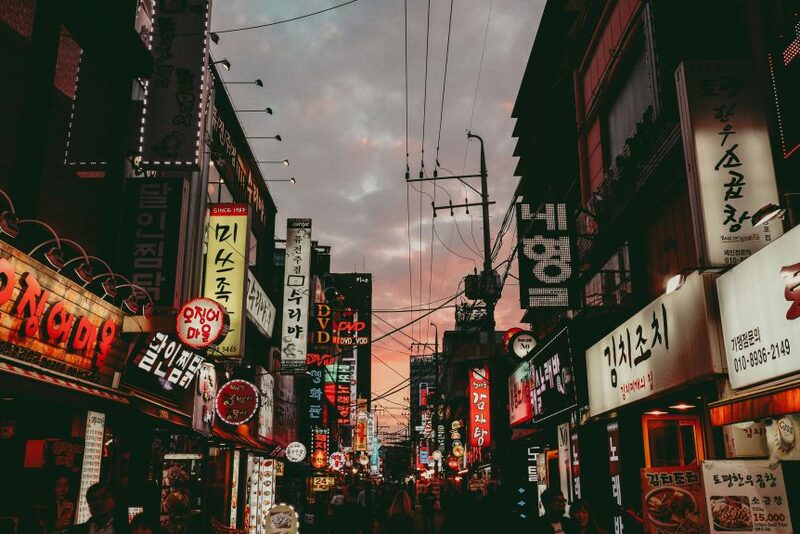 Taking a stroll on the street and you can easily find Korean restaurants, mini-marts, grocery stores, beauty salons, traditional medicine clinics, law offices and real estate companies. Many young Korean are found leisurely walking or riding bicycles on the street. In Vietnam, hansik (Korean food) has become a dining-out staple due to the popularity of Korean soap dramas and K-Pop Wave. There are generally three types of Korean restaurants you might encounter here: Vietnamese-owned targeting mainly Vietnamese customers; Korean-owned targeting a range of international customers; and Korean-owned and opened especially for their own community. Each of them has different style of service, menu focus, and different taste as well as price range. As expected, the Korea Town here offers the most authentic Korean food that are quite similar with what people have in Korea. Popular dishes include Korean BBQ, mixed rice (bibimbap), rolled rice (kimbap), and rice accompanied by various dishes such as kimchi stew (jjigae) and soft tofu stew (sundubu jjigae). Taekwondo centers, Yoga clubs, and Churches also have been set up to serve the Korean enclave. However, bars and nightclubs are rarely seen in the neighborhoods. The area supports a private school for the Korean community, where the main language is Korean: Korean International School — KIS (호치민시한국국제학교). 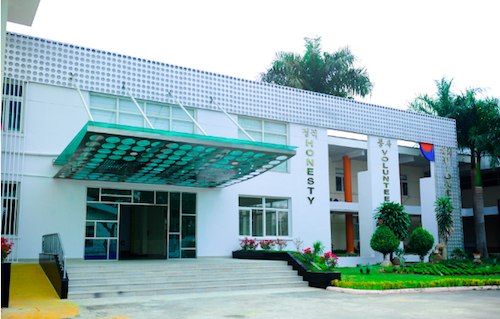 The school was established on August 4, 1998 and serves kindergarten through senior high school. As of 2009 it is the second-largest South Korean international school in the world, after the Jakarta International Korean School. The 24-page colour-printed Vietnam-Korea Times published every Tuesday cover a wide range of topics from politics and economy to culture, education, art, history, the Vietnamese nation and its people, business activities and community information. It is the collaboration of Vietnam Pictorial, a Vietnam News Agency (VNA) publication, and a newspaper for overseas citizens of the Republic of Korea (RoK). 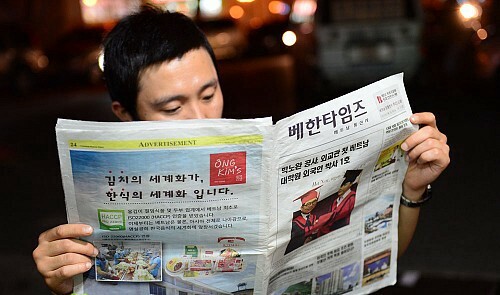 Seventy percent of the newspaper’s content is provided by Vietnam News Agency while the rest is contributed by South Korean experts and writers. There is also mobile application called VHLife that provides a variety of information on business registration, housing service, flight timetable, discounted restaurants and news in Korean. The app attracts a huge number of Korean users who are living in Vietnam and is available to download on both Apple and Google Store. So that’s all about what you should know about Korean town in Saigon. And there’s also 2 little Japan Town in the city. Don’t you know that? Now grab your balo and explore the beautiful city! How to watch the World Cup 2018 on Laptop or Smartphone in Vietnam?